Lending support. Encouraging words can make all the difference in the world, just ask someone who has been on the receiving end of those words. 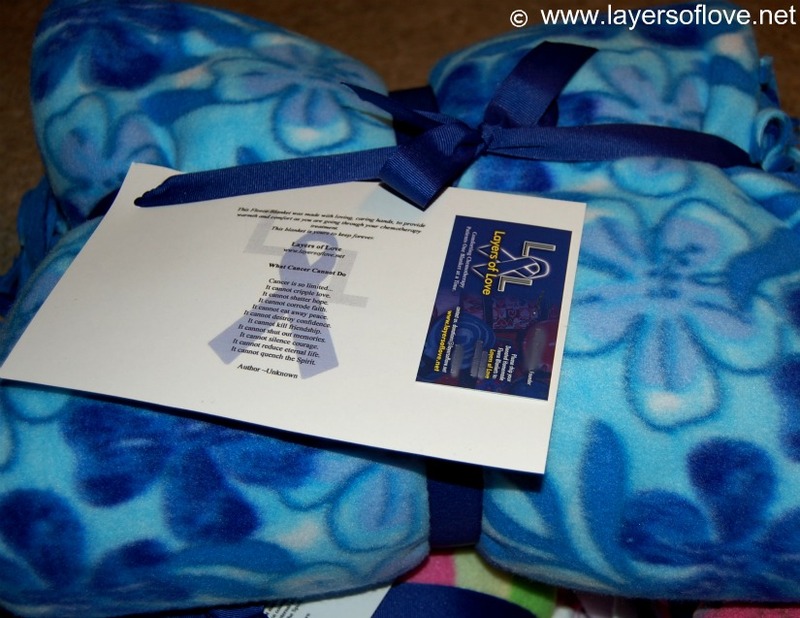 Our mission here at Layers of Love is simple: Comforting chemotherapy patients one blanket at a time. We have been collecting blankets to give to chemotherapy patients to provide them with comfort and warmth as they are going through their treatment for cancer, my goal has aways been to give them this comfort, at a time in their lives, when perhaps they will need it most. It’s not only about having a warm blanket, it’s about knowing they are not alone in their fight against this terrible disease. So that brings us to our new campaign. This photograph below is an example of the tags we attach to every blanket we donate to a chemotherapy patient. We are looking to add something to our tags. 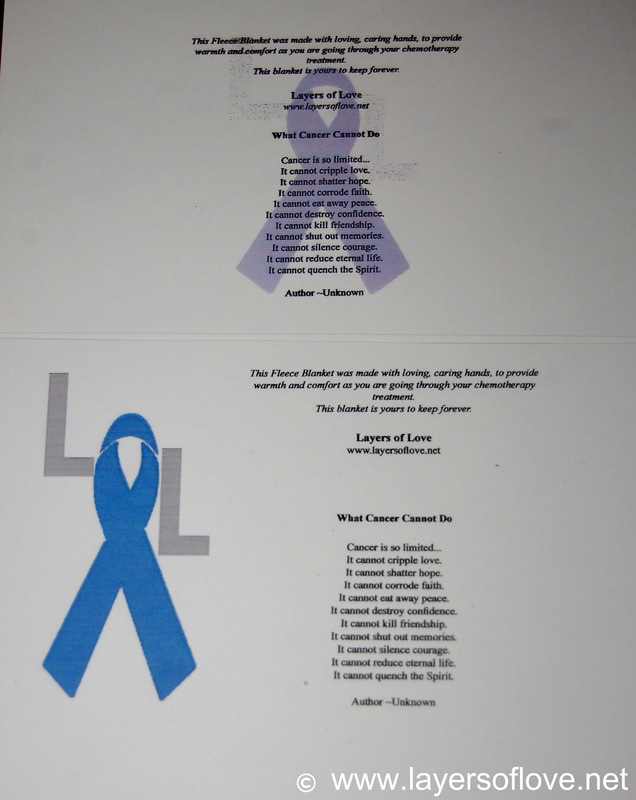 We are looking for cancer survivors who wish to lend their encouragement. How can cancer survivors help us? Send us a short bio on their success in fighting the disease. What encouraging words did you hear while fighting cancer? What or who helped you to fight even harder? How are you doing now? You can send us whatever you would like to add along with the short bio, perhaps a photo of yourself, or your family. We are asking for just one or two paragraphs, (or more if you see fit) it can be hand written or typed out, in a card, or on a piece of paper. It’s your story feel free to share it any way you would like. Tell your story. We would like to attach your bio along with our tag to a blanket we are going to donate, if you are an adult it will go on an adult blanket, if you are under 18 it will go on a children sized blanket. Your story will only be added to one blanket. Our goal is simple, we want to connect survivors to current patients. We want to give hope from cancer survivors to patients who are currently battling cancer. We want to connect that line of hope, when chemotherapy patients need it the most. We are very excited here at Layers of Love to start this campaign! We are sure that by connecting cancer survivors with those who are currently battling cancer that it will give hope at a time in their lives when perhaps they need it the most. Simple words on a piece of paper can make all the difference in the world. I love sharing my story. It’s endlessly healing. We are always collecting homemade fleece blankets, as long as there is a chemotherapy patient we will be collecting blankets. To date we have collected and donated over 125 blankets. We collect both adult sized blankets (2 yards length or the 72inch sized kits) and children sized blankets (48″x60″). Want to donate and not sure where to begin? Check out our FAQ tab at the top of the page. *If your group is interested in working with us please leave us a message in the comments or you can reach us at donations@layersoflove.net We have worked with many community groups and organizations, from providing you with enough scissors, to showing you how easy it is to put blankets together, we will help you to get your group on their way to making blankets! We are so grateful for each and every donation we have received, and to all of you we say THANK YOU. Since we have started Layers of Love we have been receiving, in increasing numbers, emails from many people who either know a friend or family member who is undergoing chemotherapy and have requested blankets. We are very proud to say we have never turned down one of these requests. Thanks to your support we are still providing these blankets when requested and will continue to do so. This entry was posted in Donations and tagged blankets, cancer, chemotherapy, collaboration, collecting, comfort, donated, Donations, fleece, grateful, helping, survivor, thank you. Bookmark the permalink.